Ayurveda is the oldest known system of medicine in the world. As the name suggests has its root in the vedas and means the 'science of longevity'. It is a completely herbal based medicinal system. It has zero side effects. More importantly it does not cure any disease independently of the body's natural immune system. Instead it helps the body's immune system become stronger and fight the disease on it's own. It aims at curing the cause of the disease instead of the disease itself. The herbal intake provides the necessary raw material required by the body to heal the ailment and to fight the disease. Which is why you won't find any pain killers in Ayurveda. Modern chemical based pain killers like Ibuprofen, Aspirin etc function by blocking the body system which transmits the signals of pain to your brain. It does not actually kill the pain, it only blocks the pain signal transmitting system temporarily. The pain actually still exists, only you dont realise it and the body continues to suffer! Ayurveda never suggests this temporary pain killing mechanism. Pain is a required mechanism for body to heal and cure things naturally. Pain tells our brain that something is wrong in that part. Remember the brain is the main organ that controls our whole body and pain is a mechanism to tell the brain which part needs to be given more attention and cured. Pain killers break off this very fundamental mechanism of the body's self healing natural process. Which is why people get addicted to pain killers as their body weakens more and more. Also other side effects of pain killers long time usage like temporary infertility, liver failure, stomach upset, allergy, drowsiness etc are well known facts. The herbs used in Ayurveda do not operate against the body's metabolism, their effect is registered gradually and hence have no side-effects. 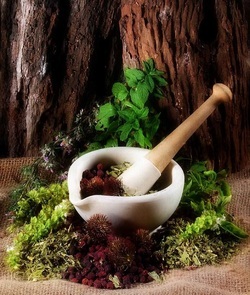 The constituents of Ayurvedic medicines is largely based on organic matter. The absence of fast registering inorganic compounds which are at times corrosive, contributes to the absence of side-effects in the Ayurvedic medicines.